Will the Supreme Court Help Mitch McConnell Destroy Obamacare? Congress will not have the power to overturn the Affordable Care Act, so Republicans are hoping the Supreme Court’s right-wingers will do the dirty work for them. Mitch McConnell, the soon-to-be anointed Senate majority leader, wants a “mulligan” on Obamacare, and he’s counting on the Supreme Court to give him one. For those who are not golfers, a “mulligan” is getting a second chance when a duffer hits a lousy tee shot. In this case, McConnell means Republicans want to tear up the Affordable Care Act and rewrite it in their own terms. But the Republican-controlled Congress will not have the power to achieve this, so it wants the Supreme Court’s right-wingers to do the dirty work for them. His cynical expectations seem to confirm the illegitimate power alliance elected Republicans have fashioned with the supposedly non-political Supreme Court justices. But McConnell tucked an awkward message in his comments—an admission of his own weakness. Forget his blustery campaign vows to destroy the ACA, which McConnell falsely characterized as an effort to “Europeanize” American healthcare (too bad that’s not the case). McConnell is belatedly conceding the GOP still won’t have the votes to break Senate filibusters or to override Obama vetoes in House or Senate. Has Mighty Mitch begun to mellow? Throughout the Obama era, he starred as the belligerent Senator No, uncompromising and grimly effective. He and his party smeared Obama relentlessly, both the person and his policies, often with latent racial coding. But McConnell told the captains of industry the only hope for unraveling Obamacare depends upon Chief Justice John Roberts and the Right Wing Five. 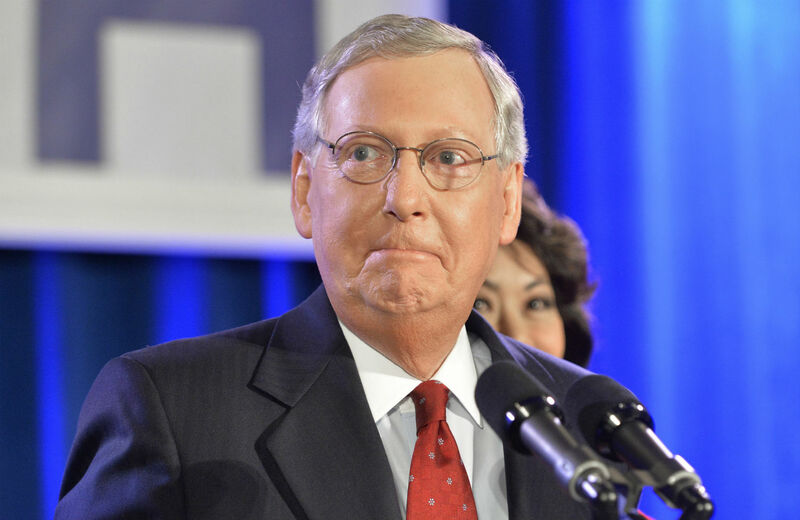 The political landscape for 2015 is not about a nicer Mitch, but about the utter reversal of political priorities confronting the triumphant Republican party. To put it crudely, Mitch McConnell is like the dog who caught the bus he was chasing. What’s he going to do with it? The reactionary factions in his backward-leaning party are eager for a grand ideological tear-down; but most folks are looking for shelter from the storm, not more chaos and upheaval. I suspect Mitch McConnell recognizes this. That’s why he wants the Supreme Court to step up and take the blame for dismantling Obamacare. That’s why he is suggesting small-ball legislative tactics—unravel ACA one step at a time, repealing the medical devices tax or the thirty-hour-week coverage for small business workers or other unpopular provisions like the health-insurance tax and penalty. These issues might pose tough votes for Senate Democrats even if Obama intends to veto them. McConnell’s first problem, however, is persuading the “red hots” in his own party to slow down. In their overwrought opposition, House Republicans “repealed” Obamacare something like fifty times (a free vote for them, since they knew their negative measures were not going anywhere). Trouble is, Republicans fell in love with their own propaganda. People “hate” Obamacare, don’t they? Isn’t that why Republicans won their big victory? Surely, the populace will cheer when the GOP slays this dreaded socialist monster. They are dangerously mistaken. The “smart politics” that won elections for Republicans could suddenly look like very dumb governing policy if McConnell and company actually go ahead and do what they promised to do. The first result will be a major crisis in government if the complicated wiring of the ACA is suddenly torn out. But the much larger political crisis will be the personal shock and injury experienced by many millions of American families who discover the government has just cancelled their health insurance. Likewise, the insurance industry would be in turmoil, with companies scurrying to protect themselves if the ACA’s delicate framework of subsidies and insurance premiums is abruptly thrown out of balance. Who would most likely be blamed for the pain and chaos? Republicans, I predict, whether they are the right-wing justices on the Roberts Court or the GOP majorities in House and Senate. McConnell and House Speaker John Boehner seem to assume that, if the Supreme Court disables Obamacare, that will force the need for new legislation and their new majority power can dictate the terms. They’ve got it backwards. If the right-wingers provoke this national crisis, trying to reverse the legislative battle they lost five years ago, President Obama will have the high ground once again. He can explain what happened in the clearest terms: the McConnell Republicans or the Roberts Republicans on the Supreme Court did this to them. Yes, there are problems with the ACA that need to be fixed. But it was impossible to make ordinary corrections because Mighty Mitch always refused to cooperate and compromise. Now the McConnell co-conspirators in Congress and the High Court want to throw the American people back to the wolves—the insurance industry and drug industry and other special interests that gouged or neglected very ill people before Obama’s healthcare reforms stopped them from cherry-picking their customers. In fact, healthcare companies were treated quite generously by the ACA. Insurers were essentially given millions of new paying customers subsidized by the federal government. In exchange the companies had to abandon cruel practices like banning customers with pre-existing conditions. I bumped into an old friend who happens to be an industry lobbyist and asked him: Who will get the political blame if the Roberts Court kills Obamacare? “The Supreme Court could turn the country upside down on this issue,” he said. He loathes the ACA and knows its flaws, but said that if you are going to take something away from people, you better have something to replace it. A victory for Mitch (or the Right-Wing Five on the Supreme Court) is basically a decision to restore the old healthcare system that profitably abused or ignored so many sick people and poor people. That political decision is for elected politicians, not jurists. If McConnell doesn’t have the votes or the nerve to force the issue, the Supremes should keep hands off. Chief Justice John Roberts upheld the ACA’s constitutionality two years ago and was bitterly denounced as a sellout by many right-wingers (though not by McConnell, who has been closely aligned with Supreme Court conservatives on its money-in-politics decisions). Now right-wingers are pushing Roberts to make up for his “error” by killing Obamacare on ridiculous grounds. McConnell has joined them. This squeeze play could be fateful for the chief justice and his lasting reputation. As I wrote recently, he is flirting with an “impeach John Roberts” campaign if he cooperates with politicians like McConnell. Roberts is clearly sensitive to the accusations of political bias and has frequently objected. That’s why it is so important for people to make loud complaints now and make sure Roberts hears them. Precious purists will object that this politicizes the Supreme Court, but it is already politicized. The deed was done by the Right-Wing Five and their Republican party. The new post-election landscape challenges another familiar political deformity—the passivity of the Democratic party. We can understand why the president is reluctant to aim critical comments at the Supreme Court. But why are other Democrats and allied groups so silent? If they fear the political fix is in at the Supreme Court, they should say so now, not wait until a decision that sets off the chaos and crisis. Deferring to the White House is not an excuse. Indeed, that is a familiar element of the party’s decrepitude—hiding behind the president, failing to resist dumb politics from the White House. This will sound naïve, but a modest first step toward Democratic revival should involve telling the truth a little more often about the party’s intentions. The mess in healthcare reform is a ghastly example of why. The White House couldn’t admit that Obama’s ACA was really a copy-cat version of moderate Republican ideas. Republicans pretended Obama’s plan was socialism. From these initial fictions, the two parties stacked up simple-minded distortions and evasions. The sincere result was Rube Goldberg complexity. Yet what never a got serious debate was the “public option,” though a majority of House Democrats favored it. That would have authorized genuine trials for the “single-payer” systems resembling the ones functioning in Europe. Obama killed those alternatives or traded them away to conservative lawmakers. If the Roberts Court decides to destroy Obamacare beyond repair (I hope it doesn’t), Democrats should start over and this time tell the truth about what they think and what they want.